If you are someone who has followed along my journey since the inception of this blog, you know that within weeks of my taking the steps to finally find something for myself, my life took a drastic change. My husband lost his job. As I have been spending these past ten months searching for my artistic self, my incredible husband has been on a search of his own. My obstacles are self-imposed and personal, Dan’s obstacles are imposed by the world and its prejudices. Somehow in this society who we are and what we have to offer becomes minuscule in comparison to our age. He has a fountain of knowledge, incredible skills, intelligence, and is hardworking and loyal to the core, yet here we are nearly a year later. We got more bad news yesterday, and then again today. I find myself feeling a little hopeless today, and worse yet I see it in Dan as well. It has been a roller coaster of emotion for months, more so for me because as always, Dan protects me and denies his own worry as to not upset me. We try to hold each other up, we try to assure each other that all will be well. To be honest I was in no mood to create today. My heart and mind are heavy. I have not given up on prayer, but maybe a little on hope. So many times in the last ten months we have had a glimmer of hope only to have it snatched away. The one consistent throughout is our love for each other, we are in this together no matter what the outcome. Tonight I drew a small sketch in an effort to express what I’m feeling. 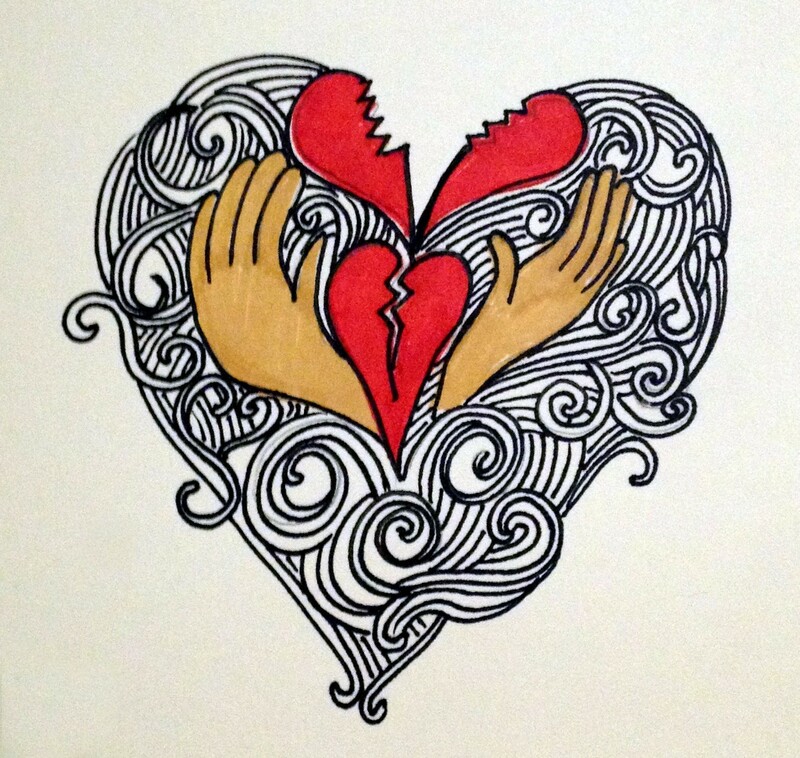 We are two broken hearts, each holding on to and supporting the other as the chaos of the world swirls around us. This entry was posted in art, Art and my life, Drawing, Family, Fine Art, Uncategorized, Words, Writing and tagged art, drawing, Family, Fine art, illustration, loving words, Marker Drawing, projects, Struggle, thoughts, Visual arts, writing. Bookmark the permalink.